The more things change, the more they stay the same it is said. It can also be said of Halloween candy. The packaging and sometimes shape and size get updates, but the offerings are still kind of the same after all the years since I last trick or treated. With recent events I've been wallowing in some nostalgia and decided to actually hand out candy this year. Our building had their event on Friday and while out shopping I picked up the above mish-mash. Sure there are some new ones out there, but the standards are still around. The Hershey's mini bars, Three Musketeers, Snickers and a couple of what were my faves: the Reeses' Peanut Butter Cups and the Sweetarts (though these came in new skull and bone shapes--fun!). Peanut butter and chocolate were always a fave and the tangy tart sweetness of those little flavored ovals are what I dug in bowls and traded candy for. Keep your chocolate bars and those crappy chalk-like flavorless Smarties! I'll take what I like and eat them until my sugar coma sets in. Ah, the good old days of Halloween and going house to house for candy when all we had to fear were razor blades in apples! Though I'm quite sure that was an urban legend started by candy companies to get kids to eat more candy. A surely brilliant and devious marketing plan for sure. And yes, it still endures as kids just want candy. 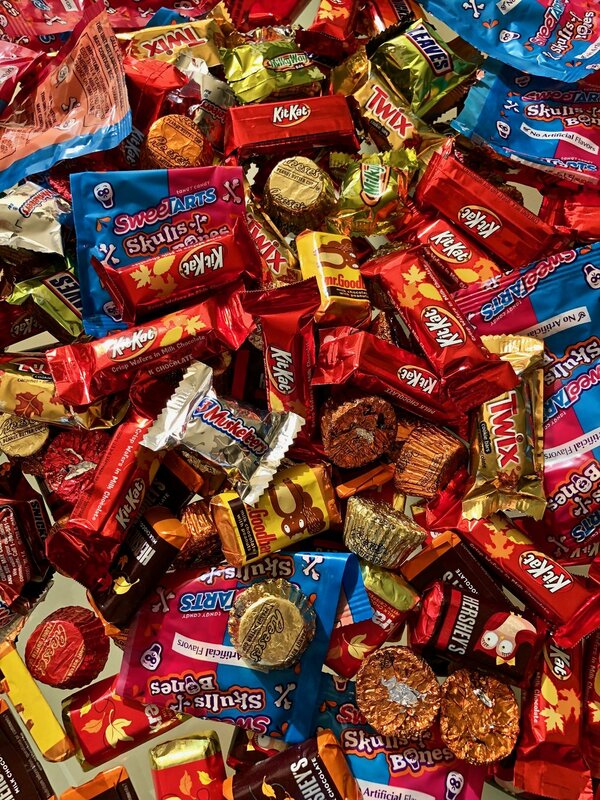 Devious, evil candy conglomerates and Halloween--a perfect combination. Speaking of candy, here's a look inside See's Candy, a relatively local California business in case you didn't know. Seems there is trouble in the automated food business as Eatsa (which I like) has scaled back and closed some of their locations. But Deli Board is expanding out of SoMa with a Market Street location. Seems those $15 sandwiches are paying off! DOSA is getting a new chef as an alum of Gramercy Tavern swoops in from NY to takeover both locations. The Denver Whole Foods gets a mac and cheese bar? Well la-di-da! We already have THREE restaurants specializing in it! They would be Mac'd, MacDaddy and Homeroom by the way. Check your veggies y'all, they might have listeria. Seriously. Doughnuts (or donuts) and beer are a thing, and not just on the Simpsons. Not the biggest beer fan, but it could be interesting. Anyone for wine and donuts? Well howdy do! SF is the new fine dining capital! So says the latest ratings from Michelin. Clear pumpkin pie?!! No! Just No! Enough with the ridiculousness Alinea. If I wanted to eat flavored gelatin the I'd just as soon get this. Boogaloos in The Mission is going to reopen making old-school hipsters happy they will have another place to line up for brunch again. What it's like to be a woman running the kitchen in the restaurant industry. The wineries are OPEN!! A great way to support wine country after the fires and of course, drink wine. Finally, these are super funny! More tricks than treats for sure. Happy Halloween!